Jay Rothberg's sculpture represents the eternal love we share with our significant other. 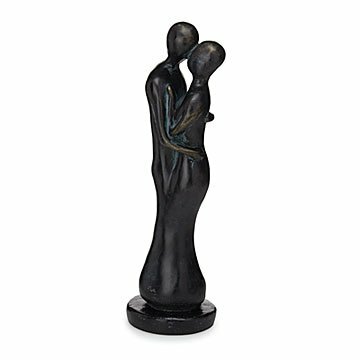 Depicting a couple in a passionate embrace, this sculpture represents the eternal love we share with our significant other. Jay Rothberg's emotive works of art are originally sculpted out of wax, then cast in bronze, and then recast using bonded resins. He finishes each piece with a traditional verdigris patina, a technique used to preserve sculptures since antiquity. Handmade in the artist's studio in Greensboro, North Carolina. Great quality. Love the craftsmenship. Elegant. A marvelously, elegant anniversary gift. Always in search of an anniversary gift that isn't run of the mill. My wife quickly fell in love with it. Many thanks. To remind my wife of 30 plus years that I still love her with all heart and soul and that she is the first women in my life that I have ever said this too. I bought this as a wedding gift for my very good friend who lives in another state. I saw it on-line and knew it was perfect for them. They absolutely love it! I plan to purchase the family statue for my sister for Christmas. The most perfect wedding gift! I searched for two months and pondered for two months; what should I get someone that has everything. An "older" couple remarrying. Then I saw this figure. It was the most perfect gift I could have ever found. I can't tell you enough how excited I was about finding this gift. It is gorgeous. The style, color, size, everything, just PERFECT! My friends I gave it to love it too! Beautifully hand crafted.